La CIA : ses chapelles, ses couveuses et ses ONG : La NED | US Go Home ! Discours de JFK qq jours avant sa mort. Il dénonce les sociétés secrètes qui s’activent aux USA, selon un ancien dirigeant de la CIA , il aurait même voulu détruire cet organisme. Il le payera de sa vie. Ses successeurs sont prévenus de ce qui les attend, s’ils ne se plient pas aux exigences de ces multiples organisations. Tout récemment les services de sécurité de la Maison Blanche ont connu des défaillances …. Un avertissement ? 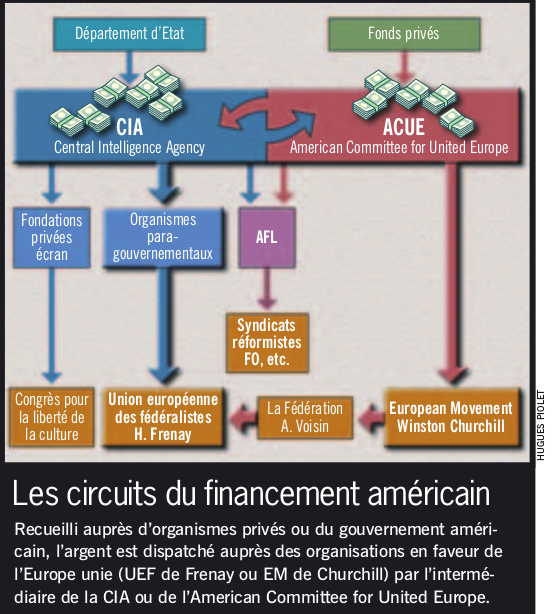 La CIA dispose de son propre budget, fourni par l’ Etat, mais aussi de fonds privés provenant d’entreprises ou sociétés dont elle défend les interets en Europe, l’ ACUE : American Committee on United Europe (ACUE). Promouvoir la démocratie et la liberté à travers le monde ! c’est ty pas beau ça ?? – et plusieurs fondations dont la fondation Jean Jaurès et la Fondation Robert Schumann. Remarque ! dans l’onglet » where we works, pour certains pays on a une liste de dépenses détaillées par domaine ou par ONG . J’ai mis en exemple la Russie et l’ Ukraine. On notera que le finacement de la NDI est multiple ( vous pouvez faire un don 🙂 ). Au hasard des articles, on découvre que la NED soutient directement des organismes à l’étranger, comme le Yuri Levada Analytical Center en Russie, une organisation indépendante de recherches sociologiques et de sondages. Le centre étudie l’opinion publique en faisant des sondages dans différents domaines, tels que la sociologie, la psychologie et le marketing. Environ 80 personnes travaillent dans le bureau du centre à Moscou, 80 organisent le travail des branches régionales (qui sont situées dans 46 régions de la Russie) et environ 3000 enquêteurs et interviewers entraînés font directement les sondages. Par ses effectifs, il s’agit d’une des agences les plus importantes de Russie. Pour la Russie on a plus de détails sur les montants de dépenses par domaine ( pour 2013 ). To support educational and legal assistance programs focusing on human rights. This organization will develop three programs that will feature public discussions and educational seminars. To reduce the corruption potential of laws and regulations that affect entrepreneurs in Russia. This organization will strengthen anti-corruption expertise by training local experts to more effectively review legislation and by supporting them in the accreditation process with the Ministry of Justice. To help citizens engage with the local bureaucracy to increase transparency and accountability. The organization will hold seminars on how to request information from the government according to existing Russian law. To increase transparency in the local municipal government and develop anticorruption awareness in the region. This project includes seminars and roundtables on methods for reducing corruption. To raise awareness of corruption. The organization will provide legal advice to citizens and will conduct research on levels of corruption and anticorruption efforts. To strengthen the capacity of groups and individuals to participate in civic life. The organization will provide training in communications strategies and ways of becoming more involved in civic life. To develop leadership skills among local youth through educational and training seminars on human rights and the media. To conduct human rights training seminars for teachers in local schools and seminars for citizens on protecting their fundamental constitutional rights. To educate young people about the lessons of the Soviet era. The organization will engage people in a discussion about what they understand of Soviet history and what implications it has for modern Russia. The organization will conduct training seminars for teachers on Soviet history and its impact on present-day Russia. Materials will be made available in print and electronic formats for teachers from around the country. To hold a series of discussions on important local issues. The organization will also develop its social media outreach capacity. To teach civic leaders to use new technologies effectively in their work. To provide citizens and members of civic groups with information regarding current events in Russia. To continue hosting human rights-oriented outreach events. This organization will operate a public debate and discussion series, which will focus on issues relevant to Russia society. To engage citizens in a discussion of local issues. The organization will update its website with information on election procedures and candidates. To build the capacity of associations to conduct internal training and external training. The organization will focus on developing skills in negotiation techniques and strategic planning training for its partners. To build the capacity of associations to conduct training and expand outreach activities. The organization will also produce analysis of situation with freedom of assembly throughout the country. To improve access to information about Russian human rights and environmental issues. This organization will maintain its website and publish print and electronic editions of a journal on environmental issues. To share information about social and economic rights. This organization will use social media and other online technologies to share information with the public, and will hold discussions on social and economic rights in Russia. To provide access to accurate information about important environmental issues. To help foster freedom of expression in Russia. This organization will provide legal assistance to journalists and media outlets and will host a series of educational trainings. To run an educational program for bloggers. The organization will operate three independent schools, bringing together active bloggers to receive training in the fundamentals of journalism. To promote freedom of information by monitoring official information resources. Monitoring reports, news, and other resources will be disseminated on the organization’s website and as printed reports. To maintain a blog-aggregator, which collects blog posts from civic activists, human rights defenders and other popular bloggers and reposts them on a single webpage. To provide an independent venue for NGOs and others to hold media events. To improve interregional cooperation among human rights workers and NGOs on new laws. The organization will create a web portal focusing on cases against civil society leaders. To maintain and expand a news website that focuses on civil society and human rights. To provide reliable and accurate information on local events through a network of regional correspondents. The organization will publicize regional human rights blogs to help further disseminate information. To preserve historical documents. The organization will digitize and disseminate Soviet era archives. To develop a web platform for the discussion of local issues. The website will include information on the role of local elected officials, news pieces and educational pieces on human rights and other subjects. To support independent journalism in the Russian Federation. To encourage the exchange of information on issues of local interest. The organization will develop an online portal to appeal to citizens becoming involved in public life for the first time. To raise awareness about the Russian judicial system. This organization will maintain a website and hold public discussions on this and other issues. To provide technical and legal support for the activities of Russian human rights organizations currently under threat. To train human rights lawyers on international judicial procedures. The organization will operate its study tour program, which will provide 14 qualified lawyers and human rights defenders with hands-on training in European Court of Human Rights procedures and norms. To educate the public about human rights. Informational and networking meetings for regional human rights organizations and civil society actors will be organized as part of this program. To help refugees to secure residency permits and basic humanitarian assistance and to provide legal aid. The organization will monitor the use of torture in Russia. The organization will publicize the results of its monitoring on its website, through partner NGOs, and in local and national media outlets. To provide free legal representation and consultation to victims of human rights violations. Assistance will include utilizing regional or international instruments for human rights protection and defense. To provide assistance to civil society leaders and NGOs in Russia. The organization will host discussions and meetings on the topic of civil society. To raise awareness of the negative consequences for human rights of new Russian legislation. The organization will monitor the texts and implementation of Russian laws that pertain to human rights. To support regional offices conducting human rights monitoring. The organization will collect and disseminate reports of human rights abuses. To formalize a nationwide information news collection network. This organization will track and tag news stories collected by its regional correspondents, update its website, develop a correspondent network, and conduct analysis of collected information to identify relevant trends. To conduct ongoing monitoring of human rights throughout the Russian Federation, and to share that information with the public and other interested organizations. To support a program of monitoring, analysis, and publications to counter xenophobia. The organization will conduct research and publish analytical reports based on its monitoring activities. To support a program of monitoring, analysis, and publications to counter xenophobia. The organization will monitor the activities of extremist and ultra-nationalist groups, and publish analytical reports and books based on its monitoring activities. To deepen local understanding of human rights through a series of roundtables and conferences, this organization will work to assist local authorities in better protecting them. To conduct human rights seminars and consultations for draft-age youth, conscripts, and their families. The organization will also work to help young people exercise their right to alternative service. To protect against human rights abuse through provision of material and technical assistance. To involve young people in a series of seminars and public events on themes pertaining to human rights, civic engagement and community peacebuilding. To monitor the treatment of inmates and detainees currently held in prison. The organization will continue to operate a legal aid center for detainees and their families. To create a database of human rights violations. To implement a human rights education and training program for local officials and NGOs. To provide assistance to Russian citizens whose right to freedom of movement has been violated. The program will include information dissemination as well as targeted practical legal support. To conduct human rights seminars and consultations for young Russian army draftees and to examine conditions in the army. To bring together and provide training for youth. The organization will conduct a series of five-day informational seminars. To monitor human rights violations throughout Russia. This organization will provide legal assistance to victims of human rights abuses, distribute information regarding abuses in the domestic and international press, and publish a newsletter. To promote broader respect for human rights in the armed forces. The organization will assess human rights conditions within military bases throughout Russia and update its website. The organization will hold trainings and seminars on gender equality in Russian public life. The organization will provide informational and legal assistance, hold trainings for lawyers, and maintain its website. To conduct a human rights and legal education program including leadership trainings for local NGOs, student workshops, and legal trainings for prison monitors. Legal assistance will also be provided to victims of human rights abuses and their families. To defend victims of human rights violations in regional and international courts. To raise awareness of the problem of gender discrimination through roundtables and open discussions with leading public figures. The organization will also lead training seminars to empower women to defend their rights and will offer free legal aid to women in need. To provide access to information and legal assistance to Russian civic activists and organizations. To implement a collaborative NGO project to assist young women in addressing the growing number of threats to their personal freedom posed by the local government. To increase the capacity of Russian NGOs to operate safely and effectively. To assist Russian human rights organizations by strengthening their advocacy and outreach capacity. The project includes a training program, consultations and mentoring and the development of a manual on advocacy campaigns. To assist civil society in Russia. The project will improve international cooperation and advocate for a greater EU role in assisting civil society in Russia. To provide legal assistance and NGO training programs for newly formed NGOs and initiative groups. The organization will include an annual training on human rights, which will provide past participants with additional training on effective legal practices for NGOs. To support new forms of civic initiatives in the Russian regions. The project will increase the capacity of and foster greater coordination among NGO activists. To improve the analytical skills of young Russian think tank analysts. The project include a two-day training in Moscow, a week-long training and research visit and publication of policy papers on democracy issues. To increase the capacity of newly formed NGOs. The organization will host trainings for youth and seminars for the leaders of new and existing nonprofit organizations. The organization will provide training for legal experts on ways to reduce the potential for corruption in legislation, and to lay the groundwork for a private-sector commitment to fighting corruption. The organization will also hold discussions on issues of corruption in four Russian regions. To provide free legal representation and consultation to victims of human rights violations in Russia. Assistance will include utilizing regional or international instruments for human rights protection and defense. To support a legal aid and education program for civic activists. The organization will provide free consultation and legal assistance. To protect historically and culturally relevant landmarks from misuse, neglect, and theft. The organization will prepare and publicize information about new laws in Russia. To encourage civic engagement of individuals and groups. The organization will provide networking and training opportunities for those who wish to become more involved in their communities. To monitor and analyze the implementation of European Court of Human Rights (ECHR) decisions in Russia. Grant descriptions are from the 2013 NED Annual Report. To increase civil society’s influence on Ukraine’s democratic transition by facilitating cooperation between NGOs and the media. AHALAR will organize three training seminars for 60 representatives from the media and civil society, a four-day study trip to Warsaw for 12 participants focusing on successful examples and best practices of cooperation between civil society and the media in the Polish context, a small grants competition and an online networking platform at http://www.activarte.org.ua. To increase the accountability of local governments in eastern Ukraine. The Donetsk-based Alliance will conduct four workshops and convene eight working groups to strengthen the capacity of newly formed local civic councils. The events will focus on using tools and strategies for networking, monitoring and advocacy campaigns to help the councils be more effective in engaging and influencing local government activities. Alliance will also develop and maintain a resource library to disseminate information and best practices and hold a three-day final conference for 30 council members. To promote Ukraine’s adherence to international human rights standards. The Association will conduct three trainings in Ukraine’s regions for a total of 60 NGO activists, monitor human rights violations by the police, and publish the results in its annual report, as well as develop recommendations to prevent future abuses. The Association will also print and distribute 300 copies of the report in Ukrainian and English. To build the capacity of Ukrainian business associations and improve the entrepreneurial	climate through coalition-based advocacy. CIPE will build the skills of reform-minded business leaders through training seminars, workshops and small grants designed to stimulate advocacy on targeted issues. CIPE will also support partner business associations to advocate for improvements in the entrepreneurial environment with a focus on reducing corruption and improving public-private dialogue. To continue disseminating independent information about and for Ukraine’s regions. The Center will maintain its popular news website, OstriV (www.ostro.org). NED support will cover the costs of three correspondents, including two in the Donetsk region and one in Kyiv, who will produce more than 100 analytical and 5,000 informational items for the website. Assistance will also be used to cover a portion of the Center’s basic operating costs. To promote greater awareness of the freedom of assembly. As part of a larger, national advocacy campaign, the Center will monitor freedom of assembly throughout the country, including the reaction of the authorities, and disseminate the results of its monitoring via a website. To increase the accountability of public figures in Ukraine. The Center UA will continue to operate its unique interactive website, Vladometr.org (Powermeter), which monitors, documents and assesses promises made by politicians, officials and prominent public figures. To promote civic activism and government accountability in the Cherkasy region. The Cherkasy CVU will hold five workshops for activists and local councilors on increasing cross-sectoral communication, improving interaction between voters, civil society and local government, and working with the public to solve pressing local issues. The CVU will also conduct a campaign to monitor local councilors, MPs and mayors of major cities from the region that will analyze pre-election platforms of those elected officials and assess their performance since the elections. Results will be posted on a special section of the CVU’s website, deputat.ck.ua. To strengthen civil society in the northern Ukrainian region of Chernihiv. The Initiative will organize a series of nine workshops and trainings for NGO representatives, journalists and members of district councils from seven districts in the Chernihiv region to resolve local problems through inter-sectoral cooperation. Following the trainings, six teams of participants will receive small grants to address local challenges. The Initiative will also publish seven issues of its newspaper and convene a final conference. To foster government accountability and transparency in southwestern Ukraine. The Chernivtsi CVU will monitor the activities of city council deputies in the Chernivtsi and Khmelnytsky regions, produce four monitoring reports and publish them in its Krok Zakhid newspaper with a print run of 1,600 copies. It will hold seven roundtables to advocate for creating legal norms on public participation in self-governing bodies and to foster relations between deputies and the public. The CVU will also convene seven training seminars and produce 600 copies of an advocacy manual for deputies, and launch an information campaign to promote public participation in local communities. During the campaign, the CVU will survey 2,000 people and disseminate 1,500 copies of a « how to » booklet on civic activism. To develop the communication skills of youth activists and enhance cooperation of NGOs in the Chernivtsi and Kirovohrad regions. The Society will organize a four-month course in civic journalism and a media competition for 70 youth leaders, as well as produce a website, guidebook and two issues of its Toloka (Community) newspaper. The NGO will also organize a study tour for the eight most promising participants and bring together 100 activists for a final conference. To increase the capacity of journalists and improve the professionalism of media in eastern Ukraine. The Press Club will organize 20 meetings covering important national and regional issues for journalists and media outlets throughout the Donetsk region. It will also convene six online workshops on solving pertinent local problems for 60 representatives of Donetsk-based NGOs, media, local authorities and experts. All activities will be publicized on the Club’s website at http://pclub.dn.ua. To stimulate informed debate and dialogue among civil society, government and the general public on issues relating to Ukraine’s transition to democracy. Through three national polls, eight expert surveys, 10 roundtables, monthly bulletins and a quarterly scholarly journal, DIF will help ensure that Ukraine’s leaders are informed about public opinion, while at the same time making the public aware about important policy debates. To raise awareness of human rights, protect freedom of speech, and educate youth about the role of media in democratic society. The Association will organize its fourth annual Kinomedia Festival, which will include film screenings and public lectures at universities in nine Ukrainian cities. The Association will also conduct a short film contest, focusing on media freedom, democracy and human rights, for students and young professionals from throughout Ukraine. To analyze current and pending legislation on the media and monitor violations of press freedom and attacks on journalists in Ukraine. The Institute will conduct independent field investigations into cases of extreme pressure or intimidation against journalists, publish an annual report on its monitoring, and disseminate the findings to media outlets and the public though three press conferences and its website, http://imi.org.ua. To foster democratic local and regional government in Ukraine. The Institute will conduct three-day training seminars in the Lviv, Chernihiv, Donetsk and Kyiv regions for 125 newly elected local and regional councilors. The trainings will promote a better understanding of the role and responsibilities of an elected official and how to best address local needs. To promote of freedom of assembly. As part of a larger, national advocacy campaign to defend and advance this human right following the 2012 parliamentary elections, the Institute will conduct two training sessions for 24 campaign activists, organize six roundtables and six lectures in the regions on proposed legislation regulating freedom of assembly in Ukraine and the country’s international commitments, convene three press conferences in Kyiv, and print and distribute 15,000 leaflets publicizing campaign events. To promote democratic governance practices in Ukraine. IRI will expand an innovative project model that has increased the capacity of the Cherkasy municipality to implement best practices in good governance. IRI will expose new municipalities to the innovative reform ideas currently being implemented in Cherkasy, and mentor the administrations in Ternopil and Ivano-Frankivsk during the reform process, bolstering existing demand for democratic reform amongst the citizenry, and developing the advocacy capacity of civil society to channel that demand. To strengthen independent media and democratic ideas and values. The Journal will launch an online version of its prominent intellectual publication, which contains analytical pieces on important political, economic and social issues related to Ukraine’s democratic transition. The new website, Krytyka Online, will also serve as a networking platform, attracting a new generation of readers and contributing to the journal’s sustainability strategy. Endowment funds will be used to support the re-design and re-launch of the Krytyka website and networking platform at http://krytyka.com. To promote and safeguard human rights. During a year in which Ukraine’s human rights behavior will come under scrutiny while it holds the OSCE chairmanship, the KHRPG will produce a series of publications on human rights in Ukrainian, Russian, and English; maintain a virtual human rights library on its website http://www.khpg.org; and operate a separate website documenting and assisting victims of human rights abuses. It will also continue monitoring draft legislation and providing recommendations to lawmakers. Finally, the KHRPG will organize a School for Human Rights Leaders, enabling 40 activists from human rights organizations to develop management and financial skills. To cover the partial costs of its 10th annual human rights film festival, Docudays UA. The theme of this year’s anniversary festival is ‘Vybor – Yest!’ (There is a Choice!). The unique event will again feature domestic and international human rights documentary films and will include public discussions and debates led by human-rights NGO representatives and experts. Endowment support will be used to cover part of the festivals’ seven-day inauguration in Kyiv in March 2013. To raise public awareness of human rights. The Association will organize the traveling version of its 10th annual human rights film festival, Docudays UA, in 24 regions of Ukraine. The traveling festival will feature 25 domestic and international human rights documentary films and will include over 260 public discussions, seminars, performances and debates led by human rights activists and NGO representatives. To monitor the work of local and regional councils in southern Ukraine. The Kherson CVU will track the implementation of local election platforms and promises in the Kherson region. Focus groups in Kherson, Novokakhovsk, Kakhovsk, Tsurupynsk and Skadovsk will inform local citizens and officials about the monitoring program. The CVU will produce an analytical report, online postings, two special editions of a newspaper, and a summary booklet for distribution during four seminars, a roundtable and press conference. To increase the accountability of local and regional authorities in the southern region of Kherson. The Foundation, which publishes the popular regional newspaper Vgoru, will increase citizens’ access to information about the activities of local and regional governments by conducting and publishing a bimonthly newspaper supplement titled ‘People and the Authorities.’ The supplement will include columns focusing on different aspects of government performance and the activities of elected officials, as well as four in-depth investigative journalism pieces on pressing issues in the region’s rural areas. All materials will be available online on the newspaper’s website, http://www.vgoru.org. To continue promoting cooperation and local activism in central, southern and eastern Ukraine. The Society will organize 14 seminars for up to 220 local activists and representatives of local authorities to promote best practices in engaging local governments to resolve local issues, Sixteen promising participants from NGOs will take part in two, four-day study tours in western Ukraine, including two seminars in Lviv. The Society will also publish three brochures containing the seminar materials in print runs of 300 copies each and distribute them to local activists, community leaders, local government representatives and the media. To increase the capacity of civic initiatives in rural regions of southern Ukraine. The organization will hold two, three-day trainings, one in each of the neighboring Mykolaiv and Kherson regions, for 25 representatives of local NGOs. New Generation will work with 10 of the best participants	to carry out work plans to strengthen their local organizations. To assist local groups with solving problems in their communities, New Generation will award eight mini-grants of up to $700. A conference, bringing together all 50 participants, will be convened at the end of the project to facilitate an exchange of lessons learned and further collaboration. To monitor the work of local elected officials in southern Ukraine. The Odesa CVU will conduct two training seminars on monitoring for 10 activists. It will continue to monitor regional and local councils in Odessa, Kotovsk, Rozdilnya, Bilhorod-Dnistrovsk, Izmail, Pozdilnya Izmail, and Reni. To disseminate its findings, the CVU will produce and distribute 6,000 copies of the preliminary monitoring results and 12,000 copies of the final monitoring results in its bulletin IzbirKom, regularly publish related articles through local online and print media, including its website at http://www.izbirkom.od.ua, and convene three roundtable discussions. To continue monitoring and publicizing the activities of deputies and political parties represented in the Ukrainian parliament. The OSF will publish quarterly monitoring reports, prepare two versions of its annual monitoring report, and a series of regionally-focused quarterly reports all of which focus on the performance of elected officials. All the reports will be available online at the OSF’s website, http://www.deputat.org.ua, and distributed electronically to parliamentarians, NGOs and the media. It will also conduct nine regional public roundtables on the program for elected officials and NGO representatives. To increase the analytical skills of journalists so they can hold accountable deputies in the Chernihiv region. Polissya will conduct three trainings focusing on new media and analytical journalism for 12 local journalists. Each journalist will create a blog to monitor the fulfillment of electoral promises by local deputies. In addition, Polissya will produce and distribute an analytical report and convene two press conferences on the project. To foster transparency and promote the professionalism of the media sector. While serving as an independent resource to assist journalists, Telekritika will continue to monitor Ukraine’s media outlets for censorship, restrictions on freedom of the press, and harassment and physical attacks against journalists. The monitoring results will be published on Telekritika’s website (www.telekritika.kiev.ua) and in its print journal, Telekritika. To promote government transparency and accountability by improving the quality and responsiveness of government-run websites and e-governance initiatives. RPDI will monitor the effectiveness of 56 government websites, disseminate the findings of its monitoring, and work with government bodies on improving the sites’ contents and performance. To mark the end of the three-year project, RPDI will produce a comprehensive analytical report and present it at a press conference in Kyiv. To promote constitutional reform. 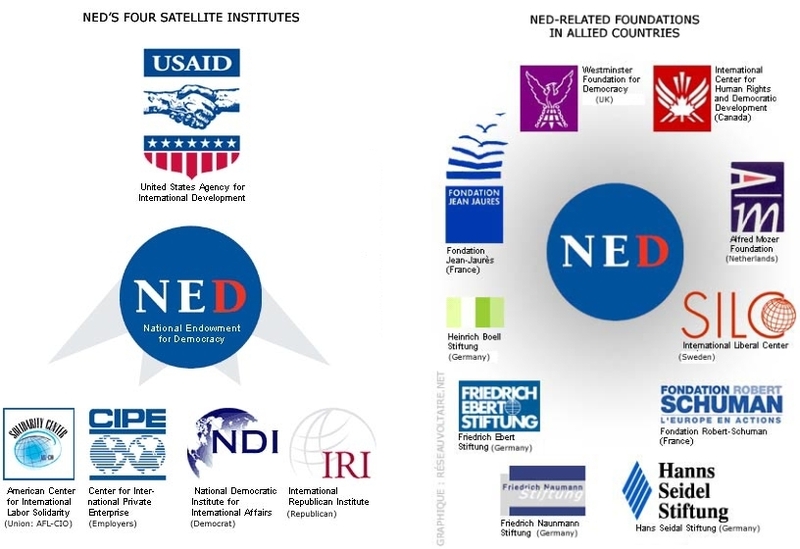 Building on previous NED-supported projects, which developed a series of proposals for constitutional reform, the organization will deepen public engagement and broaden debate on the issue by conducting a nation-wide poll, publishing a set of online informational resources, producing 1,500 copies of a brochure and a series of monthly articles, and convening a roundtable with 30 experts, government officials and NGO representatives. To promote freedom of conscience through an informed analysis of religious rights and obstructions to religious freedom. The Ukrainian Catholic University will continue to operate its Religious Information Service of Ukraine (RISU), an online news agency (www.risu.org.ua) that covers issues of church-state relations, religious rights, and conflicts between Ukraine’s various faith-based communities. NED support will cover the costs of staff salaries, website development and maintenance, news correspondents, and two roundtables. The unique website will publish more than 2,000 articles and analyses during the coming year. To continue publishing National Security and Defense, one of the most widely read policy journals in Ukraine. NED support will be used to produce two issues in 2013. Each issue, to be published in an edition of 3,000 copies in Ukrainian and 800 copies in English, will provide a thorough examination of issues of particular importance to Ukraine’s democratic transition. To promote public discussion on democracy-related topics in Ukraine. UCIPR will conduct nine research projects on various aspects of democratic development. The think tank will organize four focus groups bringing together representatives of civil society and the authorities, three roundtables, two in the country’s regions and one in Kyiv, and a conference. This year, UCIPR will focus on political party transparency and reform as well as examine the state of local democracy. Two studies, on local democracy and political party communications, will be published in 500 copies each. To raise awareness about human rights in Ukraine. The Union will produce the 2012 edition of its annual report on the country’s human rights situation, publish 1,500 copies in Ukrainian and 300 copies in English, prepare 300 copies on compact disc, and make the document available on its website at http://www.helsinki.org.ua. The Union will also organize a press conference and a roundtable to highlight the report’s findings. To strengthen youth civil society organizations in the Chernihiv, Donetsk, Zaporizha and Kirovohrad regions of Ukraine. SUM will conduct three training seminars for 30 potential civic leaders in the Zaporizha region as well as one seminar for 30 NGO leaders from all four regions; organize four working meetings for 35 NGO leaders and a two-day conference for 40 participants and hold a mini-grant competition that will provide funding for six local civic initiatives. To develop the skills of local civil society leaders to more effectively mobilize communities and engage them in solving pertinent local problems. The program will include four trainings and three study visits for local activists, as well as a mini-grant program that will provide support to five community activism projects. The Committee will produce five video clips and three interviews about successfully implemented projects and publicize them through local websites, radio and TV stations and a press conference.
. Youth Alternative will continue and expand its government internship program. The organization will select 35 students from leading Kyiv universities to serve eight-month fellowships in the Verkhovna Rada, Ukraine’s national legislature. In addition, it will select 140 students to serve five-month fellowships at local councils in 20 regions. Interns will participate in 47 related events, including orientation, training seminars and roundtables. They will also produce educational booklets, with a total print run of 500 copies. To engage youth in the process of strengthening and implementing democratic ideas and values in their communities. Modern Format will organize two, parallel, year-long schools that will present the core ideas and values of democracy and human rights through two different perspectives. One school will target journalists; the other will be for civic activists. A total of 100 youth people in the Zhytomyr region will take part in the program. To promote transparency and accountability in the use of public funds in northeastern Ukraine. The organization will train civic activists to identify corruption in local governments. It will also produce a final report to be disseminated through press conferences. To boost the capacity for investigative journalism and increase cooperation between journalists and civil society. The organization will hold basic trainings and advanced workshops for journalists and support a series of investigative pieces. It will also work with local community councils to monitor the impact of the investigative articles and produce a final report on best practices and lessons learned from the program. To stimulate public discussion on and policy responses to threats to democracy in Ukraine’s regions. The organization will identify and foster debate on key issues while developing and advocating for policy responses. It will organize roundtables, print and distribute its bulletin, and publish articles in regional newspapers. To stimulate civic journalism among youth. The organization will trainings in for youth activists from local communities and NGOs. Young people will learn how to develop and create content focusing on issues that affect the lives of citizens for social media. The most active participants will be selected to take part in a master class with a well-known Ukrainian journalist. To educate and inform youth about defending their basic civil rights. The organization will conduct seminars and trainings on recognizing, addressing and resolving day-to-day civic rights violations. To inform and educate a wider audience, the organization will produce and post a series of online training videos and informational materials, as well as publish 1,000 copies of a legal handbook. To raise awareness of legal and human rights in southern Ukraine. The organization will maintain a legal clinic providing free legal aid to the public and organize a series of events drawing attention to rights abuses, including roundtables for representatives of the local authorities, roundtables for the NGO community, and public lectures on legal rights. It will also conduct an extensive advertising campaign on rights issues, including leaflets and other materials, billboards, banners and TV spots. It will also publish bimonthly columns in local newspapers and disseminate a monthly e-bulletin on legal and human rights. To strengthen a network of human rights organizations. The organization will convene a training for representatives of human rights NGOs and initiative groups, conduct trainings in towns and villages, and operate and publicize a human rights hotline and reception centers that will provide free legal assistance to citizens. To promote human rights. The organization will conduct a training for regional activists to improve human rights monitoring. Following the training, the organization will organize volunteer groups of training participants, lawyers, elected officials and other activists to monitor human rights abuses. These groups will track reported cases and utilize the information for broader advocacy campaigns. To inform, educate and activate civil society. The organization will organize trainings on proposal writing, project development, and community and civil society development projects, as well as on project implementation, to foster civil society. To stimulate civic activism in southern Ukraine. The organization will conduct trainings in villages and towns to facilitate the implementation of local projects targeting community problems, and convene a roundtable webinar with community representatives to present project outcomes and lessons learned for representatives from Ukrainian and international NGOs. To strengthen youth activism. The organization will support a network of youth organizations and initiative groups through a series of trainings to increase members’ capacity and professionalism. It will provide informational and technical support for the youth organizations’ events and activities. The organization will promote the network by holding a press conference and disseminating a booklet highlighting the organizations’ activities to local government offices, media, schools, and other NGOs.